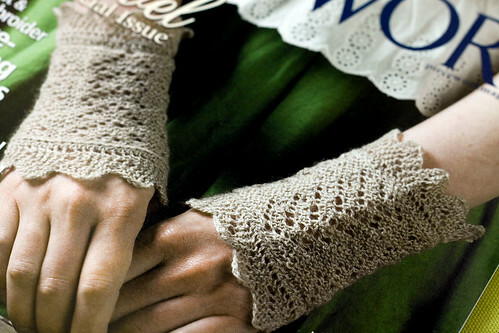 There is another cute pattern in this month’s “Piecework” magazine. These cute wrist-warmers are knit in cashmere yarn. A small project is perfect for indulging in an expensive yarn. The pattern shows how to knit the bottom trim then pick up the side stitches to knit the body of the wrist-warmer. The top lace trim is knitted on by picking up a stitch every other row. That is something I want to learn how to do. Small projects are also good for trying new techniques. This entry was posted on Friday, June 26th, 2009 at 3:00 am and is filed under Knitting. Tagged: Knitting. You can feed this entry. You can leave a response, or trackback from your own site. I agree that small projects are a great way to learn and try new things! The wrist warmers look just like you!